THESPIS. Oh, then I suppose there are some complaints? MERCURY. Yes, there are some. THES. (disturbed). Oh. Perhaps there are a good many? MER. There are a good many. THES. Oh. Perhaps there are a thundering lot. MER. There are a thundering lot. THES. (very much disturbed) Oh! And dickens a one of 'em's earning his salt. The thought of it keeps him awake for a week. All right, that’s the thunder. How about the social arrangements of women in Gilbert and Sullivan? There is a title to knock the fun right out of the subject, The Social Arrangements of blah blah blah. THESPIS. "Apollo was several times married, among others to Issa, Bolina, Coronis, Chymene, Cyrene, Chione, Acacallis, and Calliope." THES. (musing) Ha. I didn't know he was married to them. DAPH. (severely) Sir. This is the Family Edition. DAPH. You couldn't expect a lady to read any other? DAPH. I go by the Family Edition. I thought those prudish Victorian theater-goers – never mind about that. I am often incorrect in my ideas about Victorian theater-goers. I just read the second G&S, Trial by Jury (1875), about nothing but the Social Arrangements of Women, and how they are most properly socially arranged by judges, lawyers, juries, and other assorted male dunderheads, idiots, and charlatans. Perhaps the actual argument of the play is something other than what it actually says. Who can say? I had to force myself to stop after just two of these pointless, nonsensical plays. They are popcorn-like - salty and buttery, sweet and savory. Also short. And Thespis and Trial by Jury are not even the good ones. Three days of “thunder on the legitimate stage” – that’s probably enough. Let’s switch themes. Social arrangements for women, how about that one. In Lorca’s The House of Bernarda Alba, the women are all trapped in the house, trapped on stage, confined by customs but also by their iron-clad mother. The only escape is to latch onto a (completely unreliable) man. Even then, good luck. But at least a married woman gets to move away from that awful mother. Unlike in Ostrovsky’s Thunder, where married women become the slaves of their nightmarish mother-in-laws. Marriage, in that society, is a complete surrender of freedom. In both plays, the restrictions lead to tragedy, for a few characters, at least. The social order is undeniable when it strikes back, but the playwright, and the reader, are dismayed. The Demi-Monde, the 1855 play of Alexandre Dumas fils, depicts a society of women who have taken control of their own lives, money, and sexual behavior. It is a world of divorcées, cast-off wives, adulteresses, and fallen women who have created their own society in the shadow of the “proper” society from which they came, the wealthy houses that will no longer admit them. That goes on a bit, doesn’t it. Maybe I should snip it some more, but the passage is from the most interesting part of the play, in which the male lead – easy enough to guess the speaker here is a man – defines the demi-monde for us. “It is full of married women whose husbands are never seen” – that’s it in one line. He compares the women to blemished peaches, discounted to half price. This is taking an ugly turn, isn’t it? And in fact, after working through a handful of soap opera plots worthy of, and about as significant as – what’s the show about rich New York teenagers? – the woman who threatens to escape from the demi-monde is successfully shoved back into the shadows, and the audience can leave the theater certain that proper French society remains on solid foundations. I cannot say how Lorca or Ostrovsky work, or were ever meant to work, as social criticsim. Their readers are philosophically and aesthetically disquieted. Dumas's reader is reassured, a characteristic of kitsch. His hypothetical contemporary reader or viewer, I mean. This reader was annoyed. The French literary strain that I associate with Colette and Proust does not begin with this play – there’s plenty of demi-monde in Balzac – but is defined or formalized here. So The Demi-Monde should be pretty interesting. Should be. Too bad it’s so poor. Dumas, of course, went on to membership in the Académie française. Readers particularly interested in the sociology of the demi-monde should read those two or three pages of Act II and skip the rest. Quotations, such as they are, from an old translation by Barrett H. Clark, found in World Drama, Vol. 2, Dover Publications, 1933. You’ll leave out the best bits. - No. I’ll put in the best bits. - how does The Government Inspector begin and end? The play is The Government Inspector (1836), “the greatest play ever written in Russian” (VN, 35-6), or, as I think of it, The Greatest Play of the First Half of the Nineteenth Century Not Written in German (TGPOTFHOT19CNWIG). Nabokov is describing the structure of the play. The flash of lightning is the news that the corrupt little town will be visited by a government inspector. The play then races to the crash, which, strangely, is the news that the town will be visited by a government inspector. Curtain. I don’t want to argue that the play should be read at a breathless pace – the number of bloggers who practically brag about skimming – no, never mind that - but that’s how the play should be imagined. It should move like the Marx Brothers. Faster. DOBCHINSKY: Let me tell them the story, Bobchinsky. BOBCHINSKY: No, no, let me do it. You can’t tell a story like I tell a story. DOBCHINSKY: You’ll muddle it up. He muddles it up. You’ll leave out the best bits. BOBCHINSKY: No. I’ll put in the best bits. The worst bits as well. Leave it to me, Dobchinsky. BOBCHINSKY: Oh, make him shut up! GOVERNOR: For Christ’s sake, let’s have it. Spare my blood pressure. Take a seat, Petr. Bobch. and Dobch. are both named Petr. Is that last joke beneath you? Not me, no, no. Not me. I want the worst bits and the best bits. Bobchinsky is right, by the way. His story includes the hot pie stall and a fresh salmon snack and a keg of French brandy and the newborn son of the barkeep, a “bright little chap,” who will be like his father and “run the bar some day.” Also, somehow, he tells the governor that the government inspector is already in town. GOVERNOR: Good morning, gentlemen. I’ve got some news for you. Appalling news. We’re to be visited by an inspector. A flash of lightning – half a second. The GOVERNOR sits down. And it ends, just before the famous tableau, with “There is a rolling thunderclap.” No other translation begins or ends like this. Gogol’s play, the one in Russian, doesn’t, either. That end should be more like “The words strike them like a thunderclap.” Nabokov spins that last simile of Gogol’s into an overarching metaphor. Adrian Mitchell literalizes the metaphor – he is actually stealing it from Nabokov! Terrible, the liberties translators take. Tsk tsk. I just read the Joshua Cooper (Penguin Classics) translation, and poked around in a bunch of others, and I have to say, if you do not read the Adrian Mitchell version, y’ain’t read Gogol. I don't care what liberties he took. Ain’t much lightning or thunder in those others. Those who remember The Young Ones will feel a pang of envy when they learn that Rik Mayall starred in the first production of Mitchell’s The Government Inspector. I felt more than a pang. BARBARA. I never knew you were so frightened of thunder. I’m not. In the small-town Spain of Lorca’s cataclysmic The House of Bernarda Alba, the unmarried girls are trapped in the house with their horrible mother. Only marriage allows the possibility of escape. In the Volga River town of Alexander Ostrovsky’s Thunder, or The Storm, or The Thunderstorm (1859), the unmarried women are allowed to walk openly with men. It’s the married women who are forced into seclusion, subject to the rule of their mothers-in-law. If this sounds odd, not quite Russian, well, it’s not. Alexander Ostrovsky, lawyer and successful playwright, while helping with an economic survey came across a town with these unusual customs. They were poured directly into what has become his most famous play, the only Ostrovsky play I’ve read. The plot is pleasantly melodramatic. Between a single friend who is all too encouraging and fear of her mother-in-law (the husband seems nice enough), a married woman, Catherine, is almost pushed into a love affair. The affair is passionate, but insubstantial. Catherine’s guilt is all too real. Guess the ending. DIKÓY. And what is thunder, in your opinion? Eh? Come on, tell us. No, Catherine is not actually struck by lightning – that was my guess. The thunder jolts the story to it’s tragic end, though, just as the anti-rationalist merchant above claims it will. I haven’t written a word about the mother-in-law, a great comic monster with a heart of ice. I say ice, because her role in the end causes chills. The other characters are mostly types, but the heroine somehow turns into something else, something more substantially tragic. Great part for an actress, huh? Even better for a soprano. I can hardly believe that it took sixty years for someone to turn this into an opera – Thunder is the source of Leoš Janáček’s Katya Kabanová (1921). Ostrovsky’s play should be an opera. It feels like one. I don’t know what that means. No, I do. Good melodrama on top of a meaningful but not quite coherent symbolic level that is probably easier to express with music than words. Translation by Joshua Cooper, from The Government Inspector and Other Russian Plays, Penguin Classics, 1972. SERVANT I’ve got the pain of those bells right inside my head. PONCIA enters, eating bread and sausage. BERNARDA No-one say a word! She died a virgin. Tell them to ring the bells twice at dawn. In between is a noisy female nightmare, a tyrannical mother, her five daughters, a senescent grandmother, all trapped in their house, trapped by Spanish mourning customs, but also by that inflexible, spirit-crushing mother. They all tear each other to pieces. The House with the Green Shutters and its nightmarish tyrant of a father begins to seem almost pleasant. At least the character’s in Brown’s novels are allowed to leave the house. The House of Bernarda Alba is worse, much worse. Spain was worse. One is tempted to read the play politically, if only because that lightning struck Lorca. He was silenced – murdered by fascists – a month after he finished this play. Age 38. Tranlsation by Rona Munro, 1999, Nick Hern Books. Those interested in Lorca, and others, will want to visit Prof. Mayhew at ¡Bemsha SWING!. When I conceived the Scottish Challenge, or, really, when I researched it, I began to wonder what, exactly, Scottish literature was. The Scottish content of Lord Byron or Margaret Oliphant or George MacDonald or Thomas Carlyle seemed perfunctory. Robert Louis Stevenson’s turn to Scotch literature, in a few novels and stories, was deliberate. Walter Scott, curiously, made a conscious turn away from Scottish subjects (think, Ivanhoe (1820)), although he never gave them up entirely. But is even a Scottish subject especially unique? Is Madame Bovary a Normandy novel? The tradition that does seem uniquely Scottish, to me, at least, is literature that really uses Scottish dialect. Scottish in fiction begins with Scott, although his use of it is limited, and is continued by James Hogg and John Galt. For Galt, the dialect is essential, but it is important to remember that he is writing for the larger English audience. He had to deftly flavor his writing with cask-aged Scotch without drowning it. George Douglas Brown adopts Galt’s method. There had been a fine cackling in Barbie… Not even in the gawcey days of its prosperity had the House with the Green Shutters been so much talked of. The Canongate Classics edition of The House with the Green Shutters I’m using does not have a glossary, but does it need it? For one thing, the reader has the internet; for another, “gawcey” is clear in context, not to mention “a fine cackling” – any writer would be happy with that one. And here Gourlay had treated him like a doag! Ah, well, he would maybe be upsides with Gourlay yet, so he might! "Well, I like young men to be quiet," said Sandy Toddle. "I would rather have them a wee soft than rollickers." Dam't, but Burns is gude." "Huts, man, dinna sweer sae muckle!" frowned the old Provost. That’s it, exactly, like spice in a bun. "Deacon Allardyce, your heart's black-rotten," he said at last. The Deacon blinked and was silent. Tam had summed him up. There was no appeal. I keep thinking I ought to do something more like a review of The House with the Green Shutters. It’s an excellent novel easily worth reading, for the non-squeamish. It is important in that it is the founder of the modern Scottish novel. I will leave it to others to decide what that means – it doesn’t mean much to me. The introduction to the Canongate Classics edition points to Brown’s influence on Alisdair Gray, whose books I have leafed through not read (Lanark looks good), and Grassic Gibbon, who has a spectacular name, a pseudonym, I am sad to say. If The House with the Green Shutters were merely the a blast at the narrowness of small town Scotland, I doubt it would be much. A well-made jape, useful satire of the sentimental romanticization of Scotland, good for a laugh. Brown is after something else, though. He has an argument to make – that the narrowness has a specific cause: lack of imagination. Strangely, he makes his case through a character who has too much imagination. It was lukewarm. He started violently - that warmth on his cheek brought the terror so near. The heavens were rent with a crash, and the earth seemed on fire. Gourlay screamed in terror. Suddenly a blaze of lightning flamed wide, and a fork shot down its centre. "That," said Gourlay, "was like a red crack in a white-hot furnace door." "Man, you're a noticing boy," said the baker. "Ay," said John, smiling in curious self-interest, "I notice things too much. They give me pictures in my mind. I'm feared of them, but I like to think them over when they're by." I presume that George Douglas Brown is in some sense describing himself, his understanding of his own artistic temperament. John in fact turns his hand to writing a bit later, with results that are dramatic and ultimately destructive, just annihilating. His father, his townsmen, all lack imagination. John has too much. If The House with the Green Shutters is more than satire, something more unusual and disquieting, it’s right here. Postscript: Madame Bovary readers may notice a certain kinship between that novel and this one. The frowsy chambermaid of the ‘Red Lion’ had just finished washing the front door steps. She rose from her stooping posture and, being of slovenly habit, flung the water from her pail straight out, without moving from where she stood. The smooth round arch of the falling water glistened for a moment in mid-air. John Gourlay, standing in front of his new house at the head of the brae, could hear the swash of it when it fell. The morning was of perfect stillness. John Gourlay, the tyrant of Barbie, is one of the two main characters of George Douglas Brown’s novel. That maid is not, but we begin with her. Actually, the key is that we begin at the Red Lion, headquarters of the enemies of Gourlay and his too-ostentatious house with the green shutters, the house mentioned in the second-to-last sentence. As usual, if the writer is careful and in control of his material, the beginning packs a lot in. The first-time reader has no hope of seeing any of this. I didn’t know who Gourlay was, I didn’t know the “new house” is the house of the title, I didn’t know anything. The hands of the clock across "the Square" were pointing to the hour of eight. They were yellow in the sun. Still with the town, not with the characters. Between the Red Lion and the Square, Brown has established the space for almost all of the outdoor scenes of the book. Then there’s that sun, the beginning of Brown’s recurring joke, that the town of Barbie has the most pleasant weather in Scotland. Dark deeds under the bright sun. Those yellow clock hands, the wash-water caught in midair, and then its “swash” – a reader who does not know the 1901 publication date can guess that we are post-Flaubert. The point of view has a nice fluidity, too. We see the maid, objectively, but then who comments that she’s lazy? John Gourlay cannot see the maid, but he can hear the water, and we know that, somehow, since we’re with him, too. Then back into the Square. In and out, up and over. The writer's imagination goes where it wants. As far as the story goes, in the five pages of the first chapter, we learn that this day, this moment, is the high point of John Gourlay’s life. By a coincidence of scheduling, all twelve of his wagons (he’s in the carrying trade – cheese, bricks, anything) will leave his hilltop yard, with its new house, and move through town at once, in a massive display of power and contempt. Massive for this little town. Everyone comes out to see it. "I hope they liked it!" he thought, and he nodded several times at the town beneath his feet, with a slow up-and-down motion of the head, like a man nodding grimly to his beaten enemy. It was as if he said, "See what I have done to ye!" It’s all downhill from here. Since the house is on top of a hill, that’s literal. Is that cheap symbolism, or is the writer who gives it up as too easy a dang fool? The posts's title is actually from Chapter 2, and could be the title of the novel. The House with the Green Shutters (1901) is an extraordinary novel. I suppose I should try to make that case, and not just assert it. For now, I’ll just assert. Anyway, it’s not a novel for everyone, and what novel is. I want to look at something else. Descriptions of characters, of people, in fiction: mostly useless? At its best – as with any element of fiction – description of faces and hands and hair is essential. Those currently enjoying Madame Bovary will see all sorts of wonderful examples of that. How often, though, are even good writers at their best? Thin face, small red mouth, pointed nose, bulging eyes, tiny ears, high forehead, a meadow of green hair – presented in a list like this, what reader really remembers it? I did not go into it when I wrote about Ivan Turgenev’s novella Rudin, but this was one of the features that made the story resemble a play. Character enters – describe character in exhaustive detail – never mention a single one of those details again. Functional, but artless. What does George Douglas Brown do? Here’s the Rev. Mr Struthers, a character mentioned earlier but only met "in person" in Chapter 20, about two-thirds of the way through the novel, and never seen again. He had big splay feet, short stout legs, and a body of such bulging bulbosity that all the droppings of his spoon - which were many - were caught on the round of his black waistcoat, which always looked as if it had just been spattered by a gray shower. His eyebrows were bushy and white, and the hairs slanting up and out rendered the meagre brow even narrower than it was. His complexion, more especially in cold weather, was a dark crimson. The purply colour of his face was intensified by the pure whiteness of the side whiskers projecting stiffly by his ears, and in mid-week, when he was unshaven, his redness revealed more plainly, in turn, the short gleaming stubble that lay like rime on his chin. His eyes goggled, and his manner at all times was that of a staring and earnest self-importance. "Puffy Importance" was one of his nicknames. All right, that seals it. This is a great description. I’m going to remember Puffy Importance long after I’ve forgotten much of the rest of The House with the Green Shutters. Why not spend a week with a little-known novel? At the end of the week, it might be better known. It should be. The grim and pessimistic The House with the Green Shutters (1901) by George Douglas Brown has been the biggest Scottish Reading Challenge surprise since the grim and pessimistic The City of Dreadful Night by Bysshe Vanolis. Unlike Vanolis, Brown is not any sort of visionary writer, which, to me, makes him more challenging. The cosmic pessimism of Vanolis exists somewhere down in the depths of the soul, to the extent that it exists at all. Brown’s grimness is altogether smaller but closer to my daily life. Brown warns the reader, repeatedly, that tragedy will ensue, and boy does it. Chapter 25, near the end, an unflinching portrait of angry abuse, is almost unbearable in its awful tension, hard on the reader, but even harder on the characters. Perhaps the results are tragic. I did not find much in the way of catharsis in the end, but who knows. The novel – all novels, really – should come with a warning label. This one is not for readers who fear: dialect writing; dry humor; a discomforting view of the world. The dialect and humor, at least, are essential to the art of the novel. Brown’s style is related to that of John Galt, and the novel is the only clear descendant of The Entail and The Provost (both 1822) I’ve ever read. Galt’s Scotland is all sunshine and wooly lambs compared to the brutal Brown. No, strike that – one of Brown’s ironies is that his town is almost always sunny. Not much of the pathetic fallacy here. The most shady doings take place in bright daylight. Brown also has some similarities to Thomas Hardy. The overbearing father is in part brought down by a younger, more entrepreneurial rival, a subplot that reminded me strongly of The Mayor of Casterbridge (1886). Hardy often seems to me to be groping at the limits of his language, attempting to express the inexpressible, like Vanolis in this sense. Brown is not just more plain-spoken but his ideas almost exclude the transcendent. Everything gets pulled back into the mud. Poor George Douglas Brown. He wrote this novel, its quality I suspect a surprise even to the author, and received some genuine acclaim, and sales. A year later, he died of pneumonia, age 33. Brutal. Let’s see what I can do with a week of The House with the Green Shutters. This curious item, copied from page 187 of Vladimir Nabokov’s Lectures on Literature (1980), depicts the streets and buildings near the house of Dr. Henry Jekyll. Most of the information presented in the map can be found in the first chapter of The Strange Case of Dr. Jekyll and Mr. Hyde (1886). Two doors from one corner, on the left hand going east, the line was broken by the entry of a court; and just at that point, a certain sinister block of building thrust forward its gable on the street. It was two stories high; showed no window, nothing but a door on the lower story and a blind forehead of discoloured wall on the upper; and bore in every feature, the marks of prolonged and sordid negligence. In the lower left, the arrow representing the “stumping” Mr. Hyde is about to crush, “like some damned Juggernaut,” the arrow representing a little girl. The scrap is not actually Nabokov’s but rather a “student drawing… with Nabokov’s alterations.” The handwriting is mostly VN’s – “Freshly painted shutters” and so on. I want to make one more alteration. 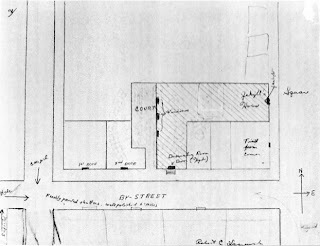 The dissecting room, the hiding-place of the hideous Hyde, is not directly connected to Jekyll’s house, but separated by a small courtyard with no other exits. 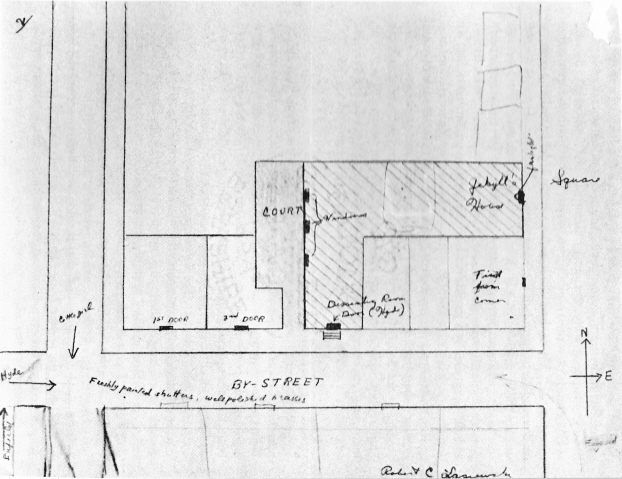 Stevenson’s precision, the fact that any good reader can reconstruct this map, is a good part of what makes Jekyll and Hyde the best thing he ever wrote. The other part is the strength of the “allegory,” as his wife called it. Hyde’s entrance has “a blind forehead of discoloured wall” and is “sinister,” “blistered,” and “distained.” It “thrusts” itself into an otherwise pleasant side street. Jekyll’s house is perfectly respectable, on a main square, and no one knows – no, that’s wrong, no one understands – the blatantly obvious symbolism of the ugly little piece in the back and to the side. Jekyll and Hyde is filled with transformative potions. By itself, this passage is merely finely purplish. It becomes more complex when read against the “compound” of “dark purple, which faded again more slowly to a watery green” that transforms Hyde back into Dr. Jekyll. How many readers begin Dr Jekyll and Mr Hyde without knowing the rudiments of the story? The characters have become part of the language. The reader has an opportunity, then, to watch Stevenson's language, and his imagery and structure – to keep track of the “how” of the novel the first time through. The “how” is amazing. Obvious, even – of course Hyde’s door is horrible, of course wine is an identity-changing substance. Obvious once I see how it all fits together, but not before. Kevin at Interpolations has written about one way it all fits together, about the clever mix of documents we read and documents we don’t that pulls the story along, and how the documents are not just a device, but a theme, another approach to the ideas of the book. I guess I have turned his well-focused post into another example of what I’m trying to get at here. This is the Stevenson book I recommend to everyone. Seventy pages in my Oxford World’s Classics edition. Culturally significant. Halloween-appropriate! And, although spoiled rotten in one way, full of surprises for any careful reader. Did I answer the question I asked yesterday? Why did David Copperfield write David Copperfield? I have been writing as if I am more interested in why Charles Dickens wrote it, which is not quite true. Copperfield is, by story’s end, prosperous, famous, artistically and spiritually fulfilled, well-fed, and happy. I’m guessing about a few of those. If I stay on the last page of the novel, I might guess that Copperfield is preparing for his own death. “My lamp burns low, and I have written far into the night… so may thy face be by me when I close my life” and so on. Even if his demise, like that of Charles Dickens, is twenty years in the future, it is not too early for some spiritual stock-taking. Or, if Copperfield is about the age of Dickens (39 at the end of the serial publication of David Copperfield), I might glibly label the book the product of a mid-life crisis. I suppose there is some use in labeling David Copperfield an unreliable narrator, but not much. He’s not inadvertently leaving clues to the truth scattered about, scraps that the reader understands better than he does. No, he’s doing the best he can with what he’s got. If I understand the facts correctly, no one, even in his own family, knew that Copperfield’s time as a child laborer was partly drawn from Dickens’ own life. I find it difficult not read that section autobiographically. It’s so firmly part of the Dickens Story. But Dickens use of the episode is the inverse of Copperfield’s. David looks at it directly, but in private; Dickens veils, but publicly. I wouldn’t want to write that about myself. The culmination of the look back is the long proposal scene that ends the book. I think Dickens is trying to turn a standard, trite novel ending into something with some real ethical weight behind it. Serious people behaving seriously, proposing seriously, marrying seriously. I think he succeeds, but it’s still dang dull. Does anyone really get much out of solid, angelic Agnes? Another problem for Dickens to solve, which he does, in Bleak House. That book – boy, that one does everything right. I omitted a central first person question from my list yesterday: Why is the narrator writing anything at all? Neither Charles Dickens nor David Copperfield answer this one in The Personal History of David Copperfield. Copperfield insists that the history is private, “intended for no eyes but mine” (Ch. XLII), but surely he, if anyone, is aware of his own history. Why bother to write it out to the length, in the Oxford Illustrated Dickens edition, of 877 pages? Copperfield has an “imperfect memory for dates” (Ch. XLVI). He supposes that many of his “well-remembered facts” are products of his imagination (Ch. XI), while others, like his mother’s funeral, he “could not recollect better” “[i]f the funeral had been yesterday” (Ch. IX). One will find some logical problems in Copperfield’s theory of knowledge, but the psychology is acute, especially his suggestion that parts of his story may very well be fiction, even he is not sure which parts those are. If it’s fiction, it’s his own fiction. One can imagine the camera floating down to the road, where we see that the boy is the actor who played Copperfield as a child. This is about as un-Proustian an evocation of the past as I can imagine, but the way Copperfield artfully joins his current happiness with the ragged boy in his past is a fine example of what Charles Dickens could do. Substitute Paris or Combray for London. That conditional construction, that vague someone from London. Proust’s narrator anatomizes himself in the same way. Charles Dickens switched to a first person narrator in David Copperfield. Once, influenced by baleful Modernists, I would have found myself surprised that Dickens was interested in, and wanted to answer, the usual first person questions. No more, though. Nineteenth century writers were no fools. What are we supposed to be reading – is it a document, writing (or is it speech, or thinking)? Did the narrator write it himself (Huckleberry Finn is pretty clearly dictated)? What is the genre of the book – memoir, travel, even fiction, fictional fiction? For whom is the writer writing? Why is the writing so good? Dickens answers every one of these questions, decisively*, spreading the theme all through David Copperfield, with all sorts of interesting touches. I’ll just mention a couple of them. In a novel in part designed by Dickens to control his own rhetoric, he includes a character whose writing goes to a painful and hilarious extreme. Authorship has its dangers. A new problem for Dickens: now to tell a first person story that still includes all of the complex, entangled plotlines of his previous novels? David Copperfield has to employ a bit more plot machinery than usual – cast members keep shuttling between London and other settings in order to put them in the right place at the right time. Bleak House solves the problem more elegantly, and JaneGS pointed me to the example of Wilkie Collins, whose The Moonstone (1868) employs a collage of documents to allow multiple first person narratives. Dickens, a few letters excepted, is stuck with Copperfield, and I have to say that I’m impressed by how little artificial nonsense (chance meetings and so on) Dickens needed – no more than in some of his omniscient novels. For example, by my count, Dickens only uses the eavesdropping device five times over the course of the long novel. One of those is really a “bursting in,” but works similarly. I understood them as failures of plotting, places where Dickens had not come up with a better way for Copperfield to witness something necessary for the plot. My understanding was incorrect. Seen as a group, a pattern is visible. Every eavesdropping scene is associated with the “fallen woman” theme (one is actually about a “fallen man”). The eavesdropping, the device itself, connects some scenes that might otherwise seem unrelated. Really clever, and one more way that David Copperfield oddly resembles In Search of Lost Time, where eavesdropping is linked to the homosexuality theme and is used so often by Proust that it simply becomes part of the texture of the novels. More Proust tomorrow, maybe. The title I have chosen, one I should apply to any number of posts, is from Chapter VII, and actually applies to Copperfield’s youthful reading, another lovely theme of David Copperfield. * My only remaining question is why Copperfield’s memoir is so neatly divided into three-chapter chunks, like a serialized novel, when evidence suggests it should be structured like a three volume novel. How many of my readers made it through that last one? It’s from the beginning of a Christmas story, chipped off of a series of seven paragraphs consisting of nothing but sentences beginning “When.” And which follow a five paragraph stretch where every line begins “Who”! Still, Dickens had reached a dead end, and he knew it. Many of his most rhetorically complex passages only barely serve the story of which they are nominally a part. The Haunted Man, is, at times, barely comprehensible. Dombey and Son is never that bad, but is still extraordinarily thick in places. I had not read David Copperfield (1849-50) when I wondered if its switch to the first person was partly an attempt by Dickens to tame his own prose. It was! It had been a bitter day, and a cutting north-east wind had blown for some time. The wind had gone down with the light, and so the snow had come on. It was a heavy, settled fall, I recollect, in great flakes; and it lay thick. The noise of wheels and tread of people were as hushed as if the streets had been strewn that depth with feathers. Now the rhetorical path is from simple to complex, though not too complex. One syllable words, mostly (with a revealing three syllable exception), short sentences, and a single first-rate simile as a capstone. I can find some brilliantly complex passages and scenes in David Copperfield (the storm scene!) but I’ll bet you seven dollars that David Copperfield is written at a significantly lower graded reading level than Dombey and Son. David Copperfield (who is also Charles Dickens) writes more simply than Charles Dickens. I hope it is not too much of a dig at Dombey and Son or even the wonderfully bizarre Haunted Man if I say: good. Problem solved. What have I read, four Scotch novels of Robert Louis Stevenson? Some Scottish stories, too, none of which were among his best, except, perhaps, the ghost story ”Thrawn Janet.” One of the novels, Weir of Hermiston, is unfinished. I wonder if it would have been the last one. His imagination was settling into the South Seas. Inspiration struck in strange ways for Stevenson, so who knows. He had proved his point, though, or at least a point I glimpse in these novels. Stevenson had deliberately set himself up against Walter Scott, inventor of the Scottish novel, inventor of the historical novel, and, in terms of influence, the Most Important Novelist of All Time. Stevenson was moving onto Scott’s turf, claiming it as his own. Kidnapped and Catriona and The Master of Ballantrae are all set soon after the events of Waverley, Scott’s first novel. The events are the most important of modern Scottish history, the Jacobite uprising of 1745, which resulted in one of the great romantic defeats, the suppression of the Highlands. Kidnapped brilliantly plunges its young, innocent hero into the middle of the chaos, ongoing after six years. Weir of Hermiston is linked more closely to Old Mortality and The Heart of Midlothian. Stevenson is working with, pressing against, only the best Scott novels, at least. Compared to Scott, Stevenson’s books are sleeker, faster, uncluttered, while still retaining a mild flavor of 18th century language. Scott has trouble keeping to his story or getting to his point; Stevenson gets there all too quickly. Stevenson’s books are less ambitious in scope, although not in art, while Scott has a grander reach, which does not always serve him well, either. The old Hawes Inn at the Queen's Ferry makes a similar call upon my fancy. There it stands, apart from the town, beside the pier, in a climate of its own, half inland, half marine - in front, the ferry bubbling with the tide and the guardship swinging to her anchor; behind, the old garden with the trees. Americans seek it already for the sake of Lovel and Oldbuck, who dined there at the beginning of the 'Antiquary.' But you need not tell me - that is not all; there is some story, unrecorded or not yet complete, which must express the meaning of that inn more fully. Hawes Inn was so famous that tourists came to see it, but Stevenson was not satisfied. Yes, Scott told a story about it, but not the story, or not the right story. It took a few years, but Stevenson found his own use for the inn in Kidnapped (1886). I should be clear – I don’t think Stevenson was really competing with Scott in the sense that he was trying to defeat or replace Scott. Instead, Stevenson was measuring himself against Scott, at the time still widely considered the greatest novelist in English. Sometimes, like Henry James, I wish Stevenson had wanted to measure himself against, I don’t know, George Eliot, or Henry James. But Scott, that was plenty ambitious. I want to point out a post at Lizzy’s Literary Life which has a fine Kidnapped-related photo and other links. Now it’s Stevenson who draws the tourists to Hawes Inn. Weir of Hermiston – I keep wanting to call it THE Weir, but Weir is a person, a surname, not a title or object or ghost – is a story of a struggling father and son. The father is a Scottish judge, the son a student; they differ on the death penalty, among other things. The first page warns the reader that dark deeds lie ahead, but the novel is cut short by Stevenson’s death before anything too ‘orrible happens. Friends of Stevenson claimed that he told them the plot; it sounds exciting and absurd. The novel we have gives us the story of the hero’s family, the story of the heroine’s family, a couple of father-son encounters, including a dull debate about capital punishment, and a superb scene of the first meeting of the love interests which by itself is a reason to regret the early loss of this writer. He was maturing. This post, in fact, should be rated PG for late Victorian sexual content. Archie and Christina have heard of each other, but not met. They both know that the other is single, attractive, of the right age, and so on. In Chapter VI, “A Leaf from Christina’s Psalm-book,” they spend a church service checking each other out. I’m modernizing the language in the interest of clarity. It’s also a perfect Scottish spring Sunday, so sensibilities are heightened. According to the pretty fashion in which our grandmothers did not hesitate to appear, and our great-aunts went forth armed for the pursuit and capture of our great-uncles, the dress was drawn up so as to mould the contour of both breasts, and in the nook between, a cairngorm brooch maintained it. Here, too, surely in a very enviable position, trembled the nosegay of primroses. Last she put a ‘sugar-bool’ in her mouth, and the next moment repented of the step. It was such a homely-like thing! Mr. Archie would never be eating sweeties in the kirk; and, in a palpable effort, she swallowed it whole, and her colour flamed high. At this signal of distress Archie awoke to a sense of his ill-behaviour. What had he been doing? Now both parties are flushed and uncomfortable, but at least “[i]t seemed to [Christina] that she was clothed again.” The really deft thing Stevenson does here is slipping from character to character, giving us their solipsistic conversation, imaginary in some sense, real in another. They’re not looking at each other, but might; then they are; then they’re not; and how can we meet again after church? All in six or seven pages. Not all of Weir of Hermiston is so clever. I have a suspicion that a couple of the chapters are less finished than others. This one was ready to go. And there are six more novels, of which one is unfinished, and three co-written. Eleven novels and two substantial fragments in twelve years, along with numerous stories, travel writing and essays. The quality of Stevenson’s writing given that pace is startling, but perhaps we have here a hint about my uneasiness with Stevenson’s novels. They’re narrow, by which I mean they do not always do much. Most of these novels are boy’s books, adventure novels. By itself, the genre puts a severe limit on the scope of the novel. Treasure Island and Kidnapped must be among the dozen best boy’s novels. Individual scenes – the battle in the rigging in Treasure Island, or the entire beginning of the novel, really, in the inn, or the siege of the ship’s cabin in Kidnapped – are unsurpassable. Whatever Stevenson chooses to do with his novels, he does as well as almost anyone. Honor, friendship, tolerance, integrity – the stories explore meaningful subjects. They just can’t go too far, or they become something else. Catriona, for example, is, ethically, quite a bit richer than Kidnapped, and becomes something else. The political plot may be a bit too complex, actually. As an adventure novel, it’s succeeds only sporadically, a good thing, as I see it, since it demonstrates Stevenson extending his reach,* with a strong payoff in the South Seas fiction, and, to the extent that one can judge from what we have, Weir of Hermiston. Poor Stevenson – he died at a creative peak. Treasure Island has, essentially, no female characters. No women in Kidnapped, either, or Jekyll and Hyde, or The Ebb-Tide. Stevenson had trouble writing women, and knew it. One solution – write about pirate ships and the like. Another – work on the problem. I’m almost sad to report that the two women in Catriona are as interesting and alive as the men, and the heroine of Weir of Hermiston promises to be as good. Why sad? Because I think Stevenson had genuinely solved the problem, just before his early death. So now his best female creations are in 1) a fragment, and 2) a little-read sequel. What bad luck! Dr. Jekyll and Mr. Hyde is an exception to everything I have said. Form, style, and subject blend as nowhere else in Stevenson’s fiction. The Ebb-Tide is a different sort of book, too, an anti-adventure novel. And they’re all dang good, every one I read. Like I expect every novel to do everything! Henry James was almost irritated by Treasure Island, irritated by such good writing and imaginative power put in the service of something he was not sure was worth doing. But he genuinely, publicly, admired Stevenson’s writing and creativity, and so do I. * Catriona also contains my favorite Scotch dialect piece of Stevenson’s, a first-rate ghost story. It was also in part in play - R. L. Stevenson's "The Sea Fogs"
Napa Valley was gone; gone were all the lower slopes and woody foothills of the range; and in their place, not a thousand feet below me, rolled a great level ocean. It was as though I had gone to bed the night before, safe in a nook of inland mountains, and had awakened in a bay upon the coast. Newlyweds Robert Louis Stevenson and Fanny Stevenson née Osborne, like many new couples, took their honeymoon in Napa Valley. Tourists like other tourists, they explored a petrified forest and sampled Napa wine, “still in the experimental stage.” The bed and breakfasts of 1880 were not what they are now, so the Stevensons set up house in the office of an abandoned silver mine on the side of Mount Saint Helena, overlooking Napa Valley. Far away were hilltops like little islands. Nearer, a smoky surf beat about the foot of the precipices and poured into all of the coves of these rough mountains. The color of the fog ocean was a thing never to be forgotten. For an instant, among the Hebrides and just about sundown, I have seen something like it on the sea itself. But the white was not so opaline; nor was there, what surprisingly increased the effect, that breathless, crystal stillness over all. It was to flee these poisonous fogs that I had left the seaboard, and climbed so high among the mountains. And now, behold, here came the fog to besiege me in my chosen altitudes, and yet so beautifully that my first thought was of welcome. Stevenson follows the path of an eagle over the fog. He watches landmarks disappear into the rising sea. He learns to identify the motion of the cloud. He imagines that he is witnessing the flood of Genesis. Had this been indeed been the deluge, I should have felt more strongly, but the emotion would have been similar in kind. I played with the idea, as the child flees in delighted terror from the creations of his fancy. The look of the thing helped me. And when at last I began to flee up the mountain, it was indeed partly to escape from the raw air that kept me coughing, but it was also part in play. A marvelous piece of writing, almost my favorite of Stevenson’s, hidden in a little-known book. But not unknown. You can, if lucky, follow Stevenson’s path and see the fogs for yourself at Robert Louis Stevenson State Park in Napa and Sonoma counties. How about a Robert Louis Stevenson travel writing roundup? Well, how about it? As long as it doesn’t go on too long. I hear ya. An Inland Voyage, 1878, a canoe trip with a college chum on the rivers and canals of northern France. Travels with a Donkey in the Cévennes, 1879, a well-titled book. The Amateur Emigrant, 1895, a badly-titled book, Stevenson crosses the Atlantic to the United States, second-class, itchy and ill, and thankful every day he’s not in steerage with the rest of the Scotch immigrants. “Across the Plains,” 1883, Stevenson on the immigrant train, from New York City to San Francisco. The Silverado Squatters, 1884, another terrible title, about Stevenson’s honeymoon in the ruins of a northern California silver mine. Unread is In the South Seas (1896), another posthumous book, clearly titled. Stevenson’s South Seas fiction is so good that I have no doubt his non-fiction is enlightening. Someday. Modestine is, of course, the donkey. Stevenson is already a master of the complex-compound sentence. Enormously enjoyable, to me, and the romance of wandering through the French countryside with a donkey is indisputable. In terms of content, a minor book; in terms of ironic high spirits and charm, a masterpiece. Much vivacity, yes. A good part of the charm is veiled. Stevenson, poor fellow, wandering with his donkey, was in love, a fact that somehow leaks out once in a while. Please note the scrambled publication order of the last three items in my list. I put them in the order of actual events. Stevenson’s lady friend, in California, finally gets a divorce. Stevenson travels from Scotland to California to marry her, nearly killing himself in the process. They – Stevenson, new bride Fanny, and her teenage son Lloyd – honeymoon in Napa. Napa, in 1880, was not quite the luxury destination it is now. That’s right, the Stevensons honeymooned with a teenage boy. Yes, Stevenson immediately published a book about his honeymoon. This is odd, right? Stevenson got some material out of the trip, as well as an entire family – a book and a pile of magazine writing. His editors removed a good part of what a modern reader will enjoy most – repulsive smells, skin disease, anti-Chinese prejudice (not Stevenson’s, but his fellow railroad passengers'), that sort of thing. If at all possible, this material should be read in the restored text, From Scotland to Silverado (1966), ed. James D. Hart. Anyone interested in how immigrant travel worked will find these short books to be appealing, lively and forthright. Anyone not so interested should probably not bother. Except, except, except. These are all minor books. They contain any number of fine passages and keen, if small, insights. One of those passages is better than fine – it’s the second-best thing Stevenson ever wrote. See back here for the third-best. Tomorrow for the second. If nothing else, writing about beauty, and some helpful, challenging comments, have convinced me that the idea is worth pursuing. More reading, more writing, perhaps even more thinking. Specifically, mostly, The Stones of Venice. So one lesson here is to not read John Ruskin. It causes one to start blathering about beauty. Leafing through Donoghue, a quotation-heavy book, it becomes clear that a lot of high-quality eyewash has been generated on the subject. This week, I have certainly contributed my share. This is the end of the first chapter. That first line has, I think, become the most circulated Sebald quotation. Like Erpenbeck, Sebald writes from a great distance, almost fending off the reader, keeping him away from the emotional core of the story. This first chapter is a brief story about a landlord of Sebald’s, someone he barely knew, and the returned dead in this case is someone the landlord knew and Sebald read about in a newspaper. Sebald uses Nabokov as a sort of ministering angel in The Emigrants, appearing first in a photograph, then in a book, then in person but far away, and finally (twice) right in front of the characters. Sebald’s art creates distance but then somehow closes it. The third chapter, about Sebald’s great-uncle Ambros Adelwarth, ends with a journey to the Holy Land. Yes, another – if Sebald didn’t read Clarel, I’ll eat an apple hat. The Jerusalem of 1913 is presented as a diseased Hell. Inverting Melville, clarity and calm appear on the way to the Dead Sea: “One wrongly imagines these shores as destroyed by fire and brimstone, a thing of salt and ashes for thousands of years” (143). The travelers, Ambros and Cosmo, are a homosexual couple, a fact mentioned once, obliquely: “Of course, said Uncle Kasimir, he was of the other persuasion, as anyone could see, even if the family always ignored or glossed over the fact” (88). Ambros is nominally Cosmo’s servant. The trip to the Dead Sea is at the end of their story, after we have already learned about the deaths of Cosmo and (in detail) Ambros. Why go back to 1913? Why describe the whole trip through Ambros’s detailed but reticent agenda book (more distance)? Sebald wants to end with another curve, not one of Ruskin’s, although he would be happy to put it in his catalogue of curves if he could only draw it. Neither Sebald nor Ambros can describe the curve, so they resort to that mysterious word, full of everything they know but cannot say. * The Flowers of Evil, Oxford UP, 1993, tr. James McGowan, pinched from Donoghue, p. 192. ** Tr. Michael Hulse, 1996.